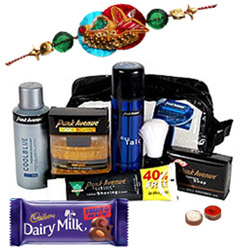 Hear your brothers saying that you are the best sister in the world when you gift them this Remarkable Display of Park Avenue Products for your Beloved Brother which comes with a free Rakhi, Roli Tilak and Chawal. This Park Avenue Gift Set consists of one Park Avenue Deo Talc-100 gm., one Shaving Brush, one Razor, one Shaving Cream-70 gms, one Park Avenue Luxury Soap-125 gm., one Park Avenue After Shave-50 ml. and one Park Avenue Deodorant-150 ml. along with one travel pouch.